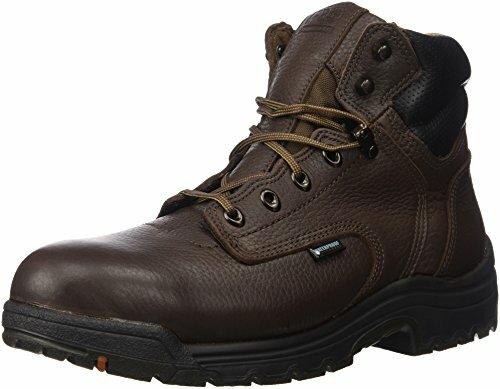 As a work boot that is equipped for jobs that require that additional safety and specific features that keep your feet protected all around, the Timberland PRO Men’s Titan Waterproof, Safety-Toe Work Boot is a nice choice for carpenters, electricians, HVAC technicians, and heavy construction. In addition, those with plantar fasciitis and flat feet can benefit from these boots as they provide that needed support to the heels and arches. We at BootRatings.com want to provide valuable information to assist you in your selection of a work boot that will meet your needs in all aspects and features. < img> These work boots have that waterproof protection you need when working outdoors in the elements, even standing in water is not an issue as they are constructed with premium leather and a waterproof membrane, plus the moisture-channeling spacer mesh is treated with an anti-microbial application which eliminates odor and wicks away moisture so your feet remain dry and comfortable. Ample protection is associated with these work boots with the lightweight alloy safety toe that meets or exceeds ASTM standards and a rubber outsole that is slip, oil, and abrasion resistant. In addition, a nylon diffusion shank provides support, torsional rigidity, and flexibility. Six-inch uppers encase your ankle for additional support and protection. These boots have lightweight alloy toes that meet or exceed ASTM safety standards and are designed to protect your toes from impact, compression, plus electrical hazards. The Titan Waterproof Safety-Toe boot is engineered with cement construction, premium leather to provide the necessary durability that can hold up in many conditions that these work boots might be subjected to. The features incorporated within protect these boots as well as your feet. Polyurethane midsoles with a high rebound heel maintain durable cushioning and shock absorption while redistributing energy and stamina back to your feet. In addition, these boots hold up well in wet conditions, even submerged in water. 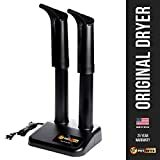 The only issue that we have found with these particular work boots is the outsole sometimes detaches itself, generally only occurring when one is pushing them to the limit and is very rough on them. It is a bonded outsole, not stitched. In short, these boots are comfortable for those with plantar fasciitis and flat feet because of the ample heel and arch support. Furthermore, a padded collar surrounds the ankle area in added cushioning. Your foot can move easily with the flexibility incorporated, plus the break in time is minimal. A breathable liner with an anti-microbial treatment prevents odors and keeps your feet dry and comfortable during long wear. These boots are constructed out of premium leather, rubber outsole, and a polyurethane midsole. In addition, the toe is an alloy safety toe, which is both protective and lightweight. A nylon shaft provides support and flexibility. There are many uses for these work boots, whether you’re working indoors in a factory, warehouse, or auto shop, or outdoors on a construction site, these work boots are designed to withstand the most hazardous jobs that require the incorporated protection that the Titan work boots have to offer. Check out our other reviews of the best construction work boots available.